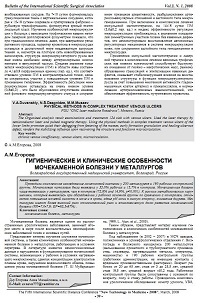 The analysis of results of complex investigation of urogenital system in 200 metallurgists and 190 workers (control group) has shown that 35,0% metallurgists and 15,7% control group had urogenital pathology. Metallurgists had more often urolithiasis (72,8% and 14,9%, p<0,001). Increased level of blood uric acid, aciduria, decreased diuresis were revealed more often in metallurgists than control group. Metallurgists had higher relative risk and etiologic factor of urolithiasis (RR=7,0-7,9; EF=85,5-87%). Мубаракшина Т.Ш. Водно-солевой обмен и функция почек у женщин в условиях высокой температуры и высокой относительной влажности воздуха: Автореф. дис. канд. биол. наук.-Ставрополь, 1989, с.7-20.